BARBATIAN, (Fifth Century), a priest from Antioch who, whilst in Rome on a mission, found himself advising the Empress Placidia Augusta. She was so impressed by his wisdom and council that she persuaded him to relocate to Ravenna, building a monastery for him near the imperial court. COLUMBA of SENS, one of a group of Spanish Christians who fled their native Spain to avoid being denounced as Christians. However, they were all martyred near Meaux (273) during the reign of Aurelian. Her relics were enshrined at Sens, but were destroyed by the Huguenots in the sixteenth century. DONATA, HILARIA, DOMINANDA, NOMINANDA, PAOLINA, PAULINA, ROGATA, RUSTICA, SATURNINA, SEROTINA, and COMPANIONS, (Date Unknown), an unknown number of Roman women martyred in an early persecution, of whom only the names of these ten are known. Their relics are enshrined in the catacombs of the Via Salaria in Rome. MELANIA the YOUNGER and PINIAN, wealthy Roman nobles, St. Melania was the granddaughter of her namesake Melania the Elder (8th Jun) and married to St. Pinian. Following the repose of their children, and to escape the coming Visigoth onslaught, they fled to Tagaste in Africa Byzacena, where they had estates. There they became friendly with St. Augustine of Hippo (28th August), taking vows of celibacy, they renounced the world, disposed of land and chattel, and built two monasteries for St. Augustine. They then went to Jerusalem, entered monasteries, where they spent the rest of their days. St. Pinian reposed circa 438, and St. Melania circa 439. PETER of SUBIACO, an Abbot of Subiaco who was blinded and imprisoned for defending the rights of the Abbey. St. Peter reposed in prison in 1003 from torture and maltreatment and is considered a martyr. SABINIAN and POTENTIAN, St. Sabinian is generally considered to have been the first Bishop of Sens, and St. Potentian his successor. Both were martyred circa 300. SILVESTER, St. Silvester was the thirty-third Pope of Rome serving from 314 until his repose in 335. During his pontificate, he helped with the conversion of St. Constantine the Great (21st May); supervised the building of the Basilica of St. John Lateran and Old St. Peter's Basilica. It was also while St. Silvester was pontiff that the Arian heresy first came to the fore; leading to the First Œcumenical Council in Nicaea (A.D. 325), to which he sent legates. An image of humility and a teacher of abstinence. Because of your poverty, riches were granted to you. O holy Pope Sylvester, pray to Christ our God to save our souls! The Trinity delights in you, O holy bishop Sylvester! As you ever stand with the angels, entreat Christ without ceasing for us all! 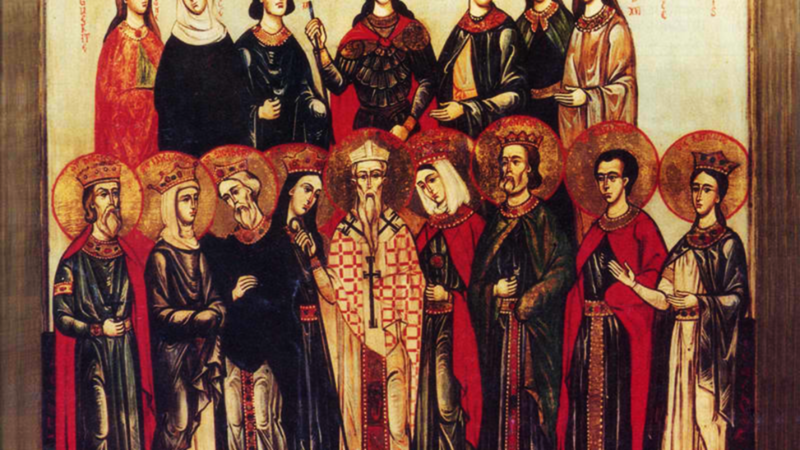 STEPHEN, PONTIAN, ATTALUS, FABIAN, CORNELIUS, SEXTUS, FLOS, QUINTIAN, MINERVINUS, and SIMPLICIAN, (Date Unknown), a group of Christians martyred in Catania in Sicily. Of the group, only the names of these ten are known.